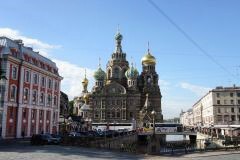 During this tour you will visit the State Hermitage museum, Church of the Saviour-on-Blood (also known as Spilled Blood Church) and the Russian Museum. The Hermitage, also known as the Winter Palace, was the main residence of the Russian Tsar’s. The palace and it’s interiors were designed and built under the supervision of the famous italian architect Bartholomeo Rastrelli. Hermitage owns a great collection of the paintings, sculptures and applied arts. The Church of Saviour-on-Blood was built on the place of murder of the Emperor Alexander II, who was killed by the explosion of the bomb, organized by the russian anarchists. It is famous for it’s beautiful stained-glass windows and mosaics. Russian Museum has great collection of the paintings of the russian artists – Aivazovsky, Repin, Kuinji, Shishkin, Brullov, Surikov and many others.